OceanConnects becomes an extension of your company! Inbound Call Centre is customised to each and every client’s requirements. IVR (Interactive Voice Response): interactive set of menu options directing callers to the appropriate department enabling your callers have their queries handled efficiently, professionally, and quickly within an agreed SLA (Service Level Agreement) of a 3 ring pick-up. Live Answering Service: your offices are always open, therefore no calls are left unanswered, no client is greeted by a voicemail, no wait time for calls to be answered and furthermore never miss another “sales” call. Customer Service: taking care of your customers before, during and after the purchasing of a product or service. Order taking: whenever a customer visits your website, makes a sale call, brochure requests, radio or press adverts, making a phone call is often the first choice for contacting your company and more businesses are seeking a competitive advantage by offering an extended service (after-hour) to potential customers? Research has shown that many buyers browse web-sites for products or services at weekends or outside office house – and they automatically reach for the ‘phone, chat or social media for further information; therefore by offering a 24/7 operation to your potential customers and by allowing them to speak to a ‘live’ operator or interact via chat will in turn increase your sales. 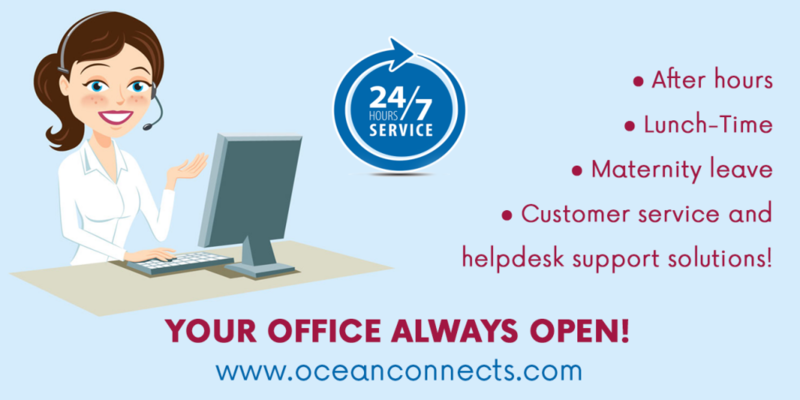 Simple and seamless solution with OceanConnects: Advise us on your own preferred method of call or chat answering, product training and refresher courses and every 6 month will ensure your brand is always protected. Event and Conference Registration: if your organising an event or a conference, not only can we assist you in promoting the event, we can also provide Live Agent Registration. This way, in addition to registering, the registrants can also ask for more information on the first call. Customer service and helpdesk support solutions: it is common known that retaining and nurturing client relationships is much more profitable than finding a new customer. We can provide your company with both contact centre and helpdesk support solutions to enable you to rest assured that all customer issues and queries are dealt with in real time, efficiently and professionally. Competition line: have you launched a competition or are you planning to and need assistance handling all calls and/or gathering contact details from participants? We have the knowledge and skill set to take this task on and deliver an well structured, cost-effective campaign. Breakdown service: if your employees need to be on call 24/7 to rapidly assist your customers, why not outsource your after-hour calls by simply transferring your main line number to one of our many numbers? How can we do that – we are open 24/7! Furthermore we have a multilingual element to our business for all multilingual callers. After-hours (and Lunch-time) call handling: when people call your company at lunch time or indeed after hours looking for information about your services or products, they expect their calls to be answered by a ‘live” agent (or at the most have an option to ‘chat’ via social media) – and from research, a high volume of callers will not leave a voice message, they simply move to the next company until they get speaking (or chat) to ‘live’ agent and therefore having a 24/7 process in place will ensure there is never another missed potential business opportunity!! Would your like to receive more information about Inbound Call Centre? Request a quote!